When you like to go to all white parties that require you to get dressed up in all white but don't feel like wearing an actual suit, try Montique all white outfits for men. Featuring cutting edge style and made of richly woven fabric, these all white outfits for men will keep you looking great. Dressing with style should never be challenging when you want to look your best for a party. Just add a Kangol hat if you're so inclined and some all white Stacy Adams or even black and white Stacy Adams shoes. 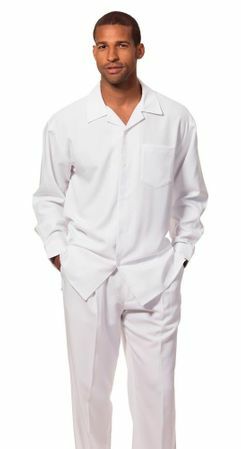 These all white outfits for men features a clean single pocket front shirt that is long sleeve and pleated pants. You'll be ready for that all white party in style with these all white outfits for men by Montique.